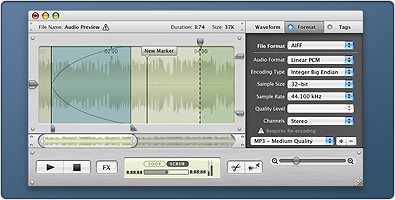 Interface Design for Ambrosia Software‘s new baby WireTap Studio. 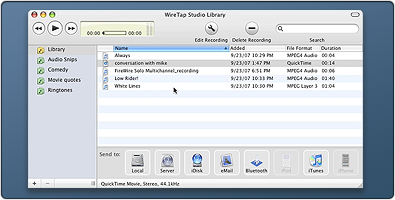 Although my icon work was minimal, most of my focus went into designing the interface for WireTap Studio including the main controller with drawer. Marcus Conge of Ambrosia Software did an excellent job on new WTS application icon. You can view WTS in action at WTS Video Tutorial. I really wish Apple went with the lighter shade as the main color instead of the darker one. Nice job btw, keep it up. ^ I meant Leopard, for those of you confused. @Steve: I disagree! I prefer the current darker shade used by the iLife suite. Great job. Next you need to talk them into re-designing their website. It is still stuck in 1999. Demoed the new WTS last week, a giant improvement over the previous version of WTP. Love the interface, great work!